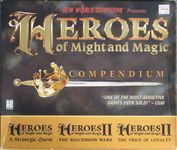 Bundle pack for early Heroes of Might and Magic titles. Also contains the classic King's Bounty. Contains game CDs, compendium manual and reference cards for each Heroes game.